The key difference, in my opinion, between cigarettes and cigars is what they deliver. Cigarettes are manufactured to deliver nicotine. Cigars are created to deliver flavor. With that in mind, e-cigarettes make sense. They deliver nicotine in the form of water vapor without smoke, tar, or other impurities ending up in your lungs (because, unlike cigar smoking, cigarettes are inhaled into the lungs). And even though the anti-tobacco zealots at the FDA won’t admit it, e-cigarettes are almost certainly healthier than inhaling real cigarettes. Which brings me to a product I yet don’t get: the electronic cigar. I’ve had some online e-cigar sellers offer to send me a sample, but I never saw any reason to give one a try. I’m guessing whoever invented these things isn’t an actual cigar smoker. If they were, they’d know that flavorless water vapor misses the point of a product that’s all about flavor, balance, and complexity. 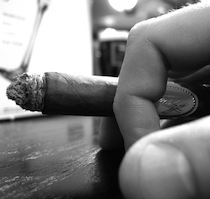 Plus, the best part of a cigar is that it forces you into a slower pace. Smoke it too fast and it burns hot. A slower, more contemplative pace is a necessity, as is sufficient time. All that is ruined by the on-off switch on an electronic cigar. I don’t begrudge anyone who just wants some nicotine. This is a free country and they should be free to make that decision. Further, I feel some solidarity with cigarette smokes who are oppressed by the same anti-tobacco laws that persecute cigar smokers. But personally, five minutes of nicotine doesn’t do anything for me. I’d smoke cigars if they didn’t have an ounce of nicotine. So you won’t find me trying any e-cigars, which eliminate the very reasons I choose to smoke cigars in the first place. I just don’t see the point. One slight note about your post. electronic cigars (and cigarettes) do indeed have flavor to them. Some e-cigars even do a reasonable facsimile of a cigar. But, generally, it lacks the complex flavors of a genuine cigar. Essentially, I think your argument holds water, but I wanted to point out these devices aren't flavorless. In fact, there are companies that specialize in a whole host of flavors from tobaccos to fruits, to more exotic flavors as well. I agree with you 100%. i smoke cigars for enjoyment and relaxation. If I don't have time for a cigar, I wait until I do. E-Cigars are not a suitable replacement as far as I am concerned. Don't get it, and never will try one. I've always assumed the e-cigars were intended for people who smoke machine-made cigars and inhale, treating them the same as cigarettes. For those people who want to get off the White Owls or Phillies or whatever, the e-cigar could be an alternative. As for premium cigars, you're right. There's no need. I've never known anyone who wanted to quit smoking premium cigars. if they don't want to smoke them, they just stop doing so. There's no quitting involved because there's no addiction. Vapor cigs are the future of smoking, they have saved me tons of cash and I can breathe again! Are you fed with the rising price of cigarettes, the taxes and the surcharges on them? Then, here comes the good news for those who love smoking, and at the same time do not want to burn their pockets. Yes, now you have a choice of buying your favorite brand of cigarette online from any of the top retailers and save a lot of money. Right here is the right website for everyone who would like to find out about this topic. You know so much its almost hard to argue with you (not that I personally would want to…HaHa). You definitely put a fresh spin on a subject which has been discussed for years. Wonderful stuff, just wonderful!